Read below for this week's column where Beags gives his take on new Luton manager John Still, York's appoitment of Nigel Worthington, and Tranmere tyyro Max Power. BEAGS SAYS: I think, Natalie, that John felt that he had earned, and owed himself, one last hurrah at a club with a rich tradition. He probably thought that the age of 62 he would not be offered another job that would excite and re-energise him like this one. I know he leaves a huge void at your club but the sequence of results between September and December has put you in a good position, considering the budget Still has had to operate with. John will feel that he has left Dagenham in far better state than he found them and I agree. BEAGS SAYS: Capturing the services of Nigel is a major coup for York in their first season back in the Football League, Ben. 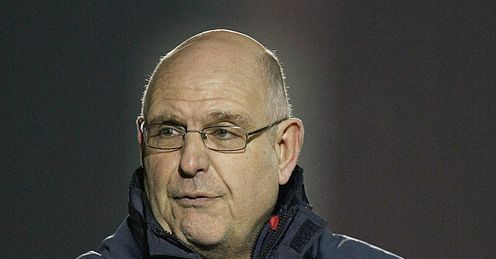 Worthington has been out of the game since leaving his international post with Northern Ireland in 2011 but has moved quickly to compensate for any rustiness by securing the services of ex-Darlington goalkeeper and Bury coach Fred Barber as his number two, and York, four points off the relegation zone, will expect Nigel to have an instant impact. The 51-year-old, who takes over a side winless in their last 11 games following Saturday's home defeat to Bradford, is more at home in his tracksuit than answering his phone in the office, and has been in a relegation battle before; he managed to keep Norwich in the Championship prior to leading them into the Premier League in 2004. Former manager Gary Mills can count himself unlucky to lose his job, but I understand the York board making a change; they have seen the side pick up six points from 33 and are desperate to safeguard their League status after years of trying to attain it. BEAGS SAYS: A massive clear-out can only happen if contracts are up, Sam, as most clubs will not pay the large salaries of players who have suffered Premier League relegation and then underachieved in the Championship. But to launch a promotion charge you need a mixture of experience in the spine of your side - which comes from games, not just age - and pace and athleticism in the wide areas through wingers and full-backs. If you have a consistent goal-scorer, as well, then you are laughing and Blackburn already have one in Jordan Rhodes, who is always hungry to listen and learn. Blackburn are a massive club and although not without their problems, I am led to believe that they have the sufficient finances to build a squad capable of challenging for promotion next season. BEAGS SAYS: Cardiff's wobble has seen their 10-point lead at the top of the table halved and Hull fans must be confident of an automatic promotion following the new signings Steve Bruce has bestowed upon them. Gedo and George Boyd are natural finishers and will ensure Hull's creativity, which has been there all season, leads to goals; Gedo, who has netted 17 times in his 31 appearances for Egypt, hit the ground running with five goals in his first five games, while the arrival of Boyd, a wonderfully balanced and gifted individual who will flourish in the wide open spaces of the KC Stadium, is very much Hull's gain and Peterborough and Nottingham Forest's loss. The last game of the season, against Cardiff, looks like an interesting one and could be a decider of sorts, but Tuesday night's 4-2 defeat at Crystal Palace proves you cannot take your eye off the ball and must take things one game at a time. Hull have a chance of being champions but you write off Watford, who the Tigers face at home on April 2, and Palace at your peril, Max. BEAGS SAYS: I punched the air when Portsmouth beat Crewe, such was my delight. I really feel for the Pompey faithful who have had various false dawns and many dreams and promises broken due to people at the top of the hierarchy gambling with the club's future. However, the fight has to go on until the end and I just hope Pompey exit administration before the end of the season and survive expulsion from the Football League; relegation is, I fear, inevitable but it is not as damning as going out of business. Portsmouth must have a League team and I wish the Pompey Supporters' Trust all the best for the biggest battle the club has ever faced on or off the pitch. Keep the faith, Mike. BEAGS SAYS: That is a big 'if' on one count and an even bigger 'if' on another, Will. I would love to see Tranmere's players and fans have a right royal knees up at the end of the season as, against all the odds, Ronnie Moore has managed to keep Rovers in the top six all through the campaign and in a top-two position for the majority of it. The Birkenhead side have not had the best of luck since goal-scoring sensation Jake Cassidy returned to Wolves and have been overhauled by some of the clubs with larger squads, but they remain in the play-off places at the expense of moneybags Bournemouth. As for Power, it would be a tall order for a player who only made his debut last season and accrued just 22 appearances this, to take the Championship by storm. The 19-year-old's chances have been limited by the performances of Sheffield Wednesday loanee Liam Palmer and captain James Wallace in the middle of the park, but with the latter now out until the end of the season, Power will get a chance to show his credentials; he must control his aggression and discipline, but I like what I have seen so far.